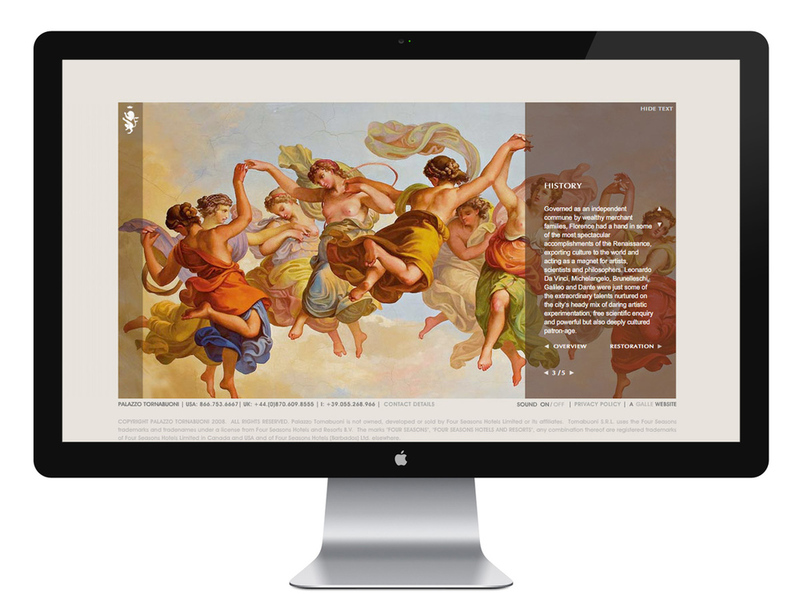 GALLÉ, DESIGN FOR LUXURY BRANDS: Brand, communications and website design for Palazzo Tornabuoni, the private residence club in Florence, Italy. Palazzo Tornabuoni was a very interesting client. The palazzo itself used to belong to one of Florence's most illustrious families. In the 20th century, demand for such large properties was low, and the palazzo was used as a bank. During this time, many of its greatest affreschi were painted over, and many of its most beautiful features fell into disrepair. Knowledge of these beautiful affreschi was gone until the current owners bought the palazzo and found a business model for complete restoration in the burgeoning market for private residence clubs. Our brief was to draw out the fabulous heritage and tie it into a 21st century concept of a members' club as a social network / gateway to the city.